We are one of the premier manufacturers of Triple Pass Rotary Drum Dryer in India. These are manufactured using quality raw materials and as per the prevailing industry standards. 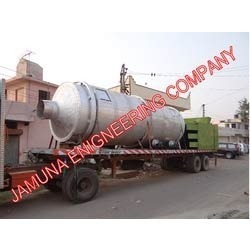 Our range is also offered in varied specifications as per the clients’ requirements. We are offering our clients with a qualitative range of Rotary Dryers/ Triple Pass Rotary Drum Dryers. Our range is environmental friendly, and has strong innovation and technology ability. These Triple Pass Rotary Drum Dryers are mainly used for drying certain humidity and size of granular materials such as sawdust, wood chips, sugarcane bagasse used in particle board industries and pellet making & briquette industries. Triple Pass Rotary Drum Dryer uses telescopic structure to dry the materials quickly. Simple designed self-insulation cylinder improves the heat efficiency to exceed 80%. Finished product temperature is lower than 60, packing can be done continuously. Looking for “Triple Pass Rotary Drum Dryer”?